James Goddard, born on 9 February 1823, arrived in South Australia on the Enterprise from England on 11 October 1840. He worked for a number of years as a whaler near Victor Harbor before marrying Eleanor (Ellen) Warner on 7 January 1844 in Adelaide. Eleanor was born on 25 April 1826 and had arrived on the Eliza from England on 14 May 1840. Their first child Harriet was born on 28 November 1844 followed by Ruth on 8 July 1846. Ruth later married Frederick Clarke at Salisbury on Christmas Day 1865. William Goddard was born on 4 June 1849 and Ellen on 19 July 1851. When gold was discovered in Victoria, James joined the exodus and later prospected in New South Wales and Queensland. On his return Goddard continued his interest in the quest for gold and kept prospecting and mining. He and Eleanor had four more children. The first child born after his return was Jane on 28 December 1854, followed by Emily on 5 October 1856, Walter on 28 August 1858 and Sarah on 17 June 1860. The Goddard family lived for several years at Salisbury but moved to Humbug Scrub in the early 1870s. For a short time Goddard was the publican of the Wheatsheaf Inn at Barossa West but eventually found employment as a government prospector and in that capacity discovered alluvial gold at Hamlin Gully in 1868. He soon became involved with company mining and in 1869 managed the El Dorado Company at Humbug Scrub. When his services were no longer required, he went out prospecting in and around the Barossa Valley and found gold at Humbug Scrub on 24 May 1870. This deposit was developed and later became known as the Lady Alice mine. As it turned out Goddard had not only found payable gold but a highly promising reef. The Lady Alice mine would turn out to be one of the most successful in Humbug Scrub and produce gold, on and off, until well into the twentieth century. After washing his four ounces from three tubs, he had taken out a licence for alluvial digging and applied for a reward. His son William, now 21 years old, took up a reef claim as well. By this time a considerable number of people had settled in the area and before the end of the year Humbug Scrub even had its own school. It was near this school that much more gold was found in November and traced for nearly 100 yards up the gully at a depth of 12 feet. Meanwhile, Goddard had offered his discovery to Captain W.W. Hughes of the Wallaroo copper mines who sent Captain James Datson, an experienced Cornish miner, to investigate. Datson arrived from Cornwall in 1847 to work at the Burra mine. 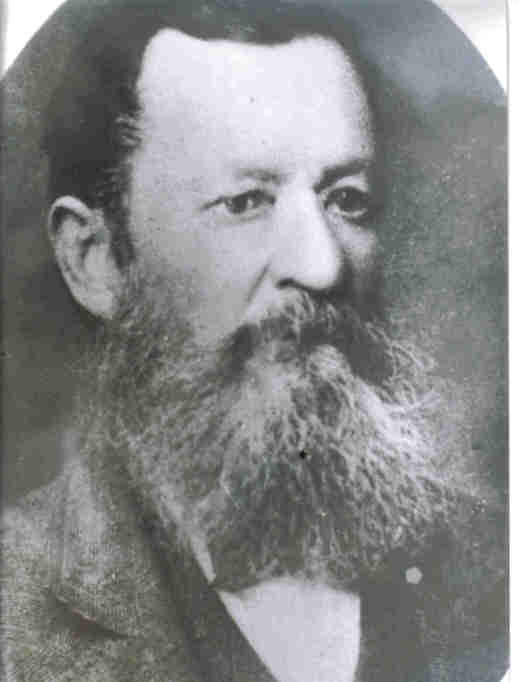 In 1864 he transferred to Moonta and when Henry Hancock took over as manager of the Moonta and Wallaroo mines he chose Datson as his senior officer. After some serious investigation, Datson only found gold and a little silver but no copper. With Hughes only interested in copper he declined Goddard’s offer. Goddard joined the government service once more and for nearly two years continued his prospecting for the government. In October 1870 his prospecting party struck gold at two different places near Williamstown and six months later, in March 1871 they bottomed a shaft on the Yatta Hill and obtained good gold from it. After news of gold discoveries at Ulooloo, Goddard lost no time in travelling to that locality. He was not very impressed with the field’s prospects and was soon back at Humbug Scrub again. Before long he located a reef, which could be traced for nearly 500 yards and it was quickly called ‘one of the most brilliant discoveries yet made in the colony’. In 1871 Goddard was still prospecting and occasionally finding pay dirt. However in May it was reported that he had not only found payable diggings but also a very promising reef. After washing three tubs he had collected four ounces of gold. On 26 May Goddard came to the Barossa Township with a number of nuggets. Having interested some of its residents he went back the next day with George Davey and F.A. Castello. They returned to the same spot and once again he found gold, as did his two companions and several other prospectors who had followed them. During 1871 James Goddard kept working steadily and very successfully at his own claims where he was in the process of building a puddling machine. His claims seemed to become richer the deeper he went. In June Goddard was made several offers for one of his claim but refused all of them. Goddard and his son had completed the puddling machine and were regularly getting several ounces of gold. In 1872 Goddard once again supervised a government prospecting party in the hope of finding gold at Mount Serle. Although by now an experienced and successful prospector of Humbug Scrub, no gold was found. At its completion, he resigned from the government services and decided to have another, and this time much closer, look at Humbug Scrub. His decision was welcomed by many of the locals as ‘from his antecedents as well as the fact that gold had long been found there, little doubt was being entertained of his being successful’. While keeping up his reefing operations, he occasionally found other rich patches which, in the absence of any assistance from investors or capitalists, enabled him to go down with his shaft, which in the end was paying handsomely. Puddling and washing was made possible with the water he obtained from the shaft. Later when Goddard went deeper and encountered the gold mixed up with copper and also a well-defined reef, he decided that it was time to either sell the claim or form a company. In July 1872 Goddard was able to sell £200 worth of gold in Gawler, earnings from the previous three days. By October Goddard had made up his mind and advertised his prospectus for Goddard’s Gold Mining Company, with a nominal capital of £12,000. The property of the ‘well known quartz claims numbers 15, 16, 17 and 18 at Humbug Scrub each measuring 100 by 250 yards’. The prospectus gave the influx of water and the lack of money to buy machinery to develop the property as the main reasons for the formation of the company. Of the 12,000 shares to be issued, 4,000 fully paid up shares would be issued to Goddard as full payment for his claims, leaving £8,000 for the development of the mine. Many applications were received for shares during the first week but all applicants were disappointed. No sooner had the prospectus appeared than ‘one of the wealthy Copper Lords of South Australia’ had offered to buy the whole property of the proposed company. The offer must have been substantial as it was accepted by Goddard, who now had the additional problem of refunding the money to thousands of share applicants. Instead of Goddard’s Gold Mining Company, it now became the Lady Alice Mining Company, with James Goddard as mine manager. It was floated as a public company in April 1873 with 6,000 shares of £1 each as start-up capital. Only half of it became available for the development of the mine as 1,200 shares were issued as paid up to Goddard and another 1,800 to William Malcolm of Gawler. On 11 August 1874 their daughter Jane married W.R. Jenkins. While successful with his mining ventures, Goddard’s family life went through some severe ordeals. In December their daughter Sarah was admitted to the Adelaide Hospital. Two years later they finally determined that Sarah, who was born in 1860 and mentally handicapped, should be admitted to the Parkside Lunatic Asylum. This was done on 3 October 1876 with the hope that she would be able ‘to make herself useful’. Sarah remained at the Asylum until her death on 9 January 1907. Three weeks after her admittance the family was informed of the death of their son William on 22 October 1876 at his home at Appila. Goddard himself was still looking for new discoveries and in June 1877 it was reported that ‘the veteran prospector for gold in this colony’ had made a new discovery near Mount Gawler. Early in 1878 Goddard was once again in charge of a government prospecting party and successful at Mary’s Gully, about five kilometres from the Lady Alice. James Goddard and family continued to live at Humbug Scrub near the Lady Alice mine during these years of hope, trials and tribulations. Goddard’s Amalgamated was still going with an office in Gawler where secretary E. Lane looked after all the paperwork. In February 1877, James Martin and Benjamin Smith were both re-elected directors and it was decided that the company should make another call of one shilling as it had outstanding liabilities of £88. On 1 April 1880, Goddard took out the lease over the Try Again mine and kept it until 8 October 1892 when it was cancelled. Early in 1880, 42 ounces of gold from the Lady Alice were displayed in the Gawler shop windows of Charles Cross, chemist of Murray Street, and was valued at £157 representing the proceeds of only 12 days’ work. By this time though the little village of Hamlin was almost deserted and in 1881 it was reported to be the site of many ruined tenements. They represented the hopes, dreams, but mostly disappointments and sorrows of those who had tried to find their El Dorado in and around Hamlin. Its glory had departed and from being a busy mining centre it had become the very dullest of dull rural villages. Goddard, ‘the father’ of the hamlet still conducted his hotel, but his duties seemed to be confined to opening the door in the morning, shuttering it later on, and at eventide lighting the lantern to show travellers, if there were any, ‘the locale of the place’. On 14 October 1884, his son, Walter Goddard wrote to Bedford Hack requesting a Miner’s Right to do some more prospecting at Humbug Scrub. Both father and son remained interested in that elusive pot of gold. 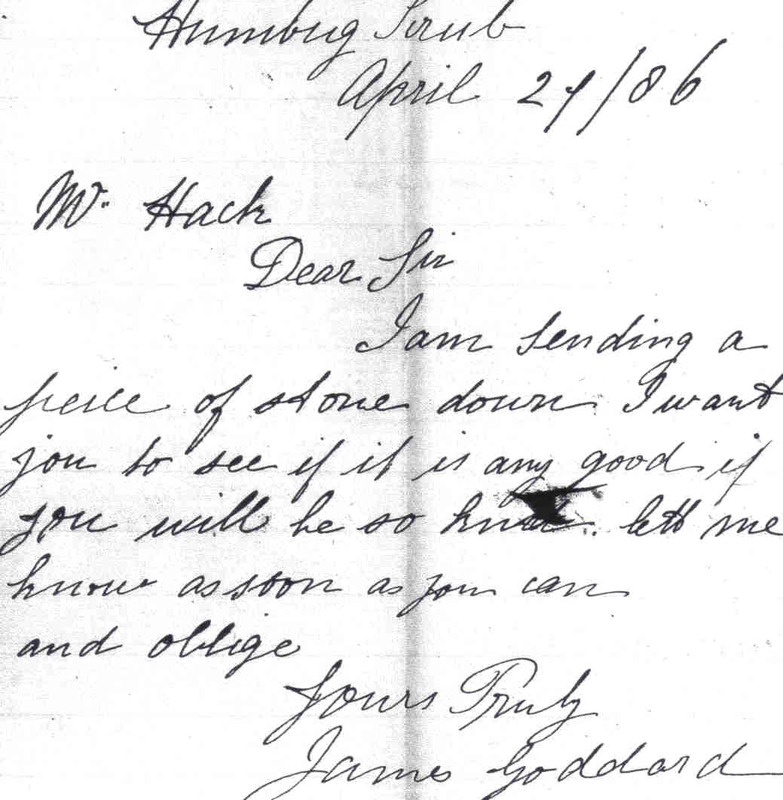 In April 1886 James Goddard was still prospecting and wrote from Humbug Scrub to Hack asking him to identify some of the stones which he had included. While forever busy prospecting and digging, James Goddard must have found the time to learn to read and write as well. When he married Eleanor Warner on 7 January 1844, both he and his bride signed the marriage certificate with a cross. A year later he took out a lease of about 17 acres adjoining the Lady Alice mine, where it all had started so many years ago. Goddard’s daughter Ellen, who also had remained at Humbug Scrub, ran the post office there until her marriage to William Allen in 1886. In 1886 Goddard still ran the local hotel, which was supplied by the Gawler Brewery, and a shop. Occasionally he provided lunches for visitors who loved to hear his stories of the Lady Alice and other mines and mining companies. One visitor later wrote, ‘if one wishes to hear reminiscences of the past days of mining in the Barossa, Mr Goddard is the one to get hold of. In spite of advancing years he still has the same enthusiasm and when the weather is suitable goes gold seeking’. As a result of his labour he was able to show his visitors about £20 worth of beautiful alluvial gold specimens. At Humbug Scrub there was also renewed activity and Frank Bowman applied for his Miner’s Right on 17 January 1887 and James Goddard, expecting an influx of miners, applied for a business licence again in February to run the hotel and renewed the licence every three months for the next few years. James Goddard died on 6 June 1897 age 76 at his home at Humbug Scrub. In 1898 his wife Eleanor put up for sale the building next to the Lady Alice which they had used as their Boarding house and Post Office. James Goddard, his wife Eleanor and daughter Sarah are all buried at the St John's Cemetery Salisbury.